WebTimeTracker is a web based timesheet application that allows you to manage projects and track time using a standard web browser. It is ideal for businesses that want to assign tasks to employees and then gather data daily or weekly on the actual time spent on each task. Easy to Use Timesheet Interface - Employees can fill in their timesheets from wherever they are, anywhere in the world, any time, using a standard web browser. Simple intuitive interface reduces time entry errors. Effective Project Tracking - Track any number of projects and tasks. Define your company's organizational structure (groups, employees, projects, and tasks). 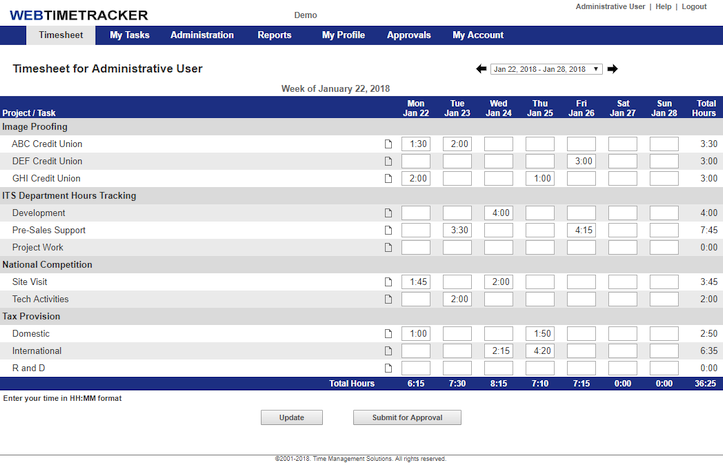 Assign rates by employee, project, or task for time billing purposes. Compare actual effort versus estimated effort to get a complete picture of your project's progress. Accurate Productivity Analysis - With the WebTimeTracker timesheet, you will be able to see who's working on what, compare billable and non-billable time, and keep track of incomplete employee timesheets. Practically No Training Required - Set-up is easy and quick. Online help is just a click away. Unlimited free telephone and email support is available if you ever have questions or need help. Powerful Online Reporting - Detail and summary reports provide in-depth reporting and analysis to improve decision-making. Analyze profitability and productivity by project, department, or user. Managers can run real-time reports on employee time data. Employees can run reports on their own time data. Download Timesheet Data - Timesheet data can be easily exported to Excel or a text file for simple integration into other software. Email Reminders - Email notifications can be sent to remind users to complete and submit timesheets. Note Feature - Employees can add a weekly note to each project/task entry on their timesheet. Control Access - Multiple authorization levels to control access to data. Managers can view and approve employee timesheets. Expandable - Our system was designed for companies of any size. There is no limit on the number of projects, tasks, and employees you can add. 256-Bit Timesheet Security - Sensitive data is secured using true 256-bit encryption. Data Protection - Our servers are located in a state-of-the-art computer center. The facility has multiple backup systems with 24-hour on-site monitoring. Affordable - Track your time for from only $4.75 per user per month. Volume discounts are available.